One of the leading contemporary composers of Yiddish song, Josh Waletzky (b. 1948) grew up in a family that was deeply embedded in the secular Yiddish world of Camp Boiberik and the Sholem Aleichem folkshuln. As Itzik Gottesman writes “Camp Boiberik was a secular Yiddish culture camp which existed from 1923 to 1979 near Rhinebeck, New York (the camp site is now owned by the Omega Institute). Camp Boiberik was part of the Sholem Aleichem Folk Institute, a non-political Yiddish cultural organization with its center in New York and Sholem Aleichem Folk shuln (schools) in a number of states in the U.S. The Director and guiding spirit for most of Camp Boiberik’s existence was Leibush Lehrer (1887-1964), a leading Yiddish pedagogue, writer, philosopher and lyricist.” The camp took its name from a mythical vacation resort described by Yiddish writer Sholem Aleichem. Waletzky’s mother, Tsirl, was born in 1921 to parents who had immigrated to New York from Galicia. While her parents maintained a traditionally observant household, Tsirl became involved in the secular Yiddish movement, finding her niche as a visual artist. Tsirl illustrated a large number of publications by secular Yiddish organizations such as the Sholem Aleichem Folk Institute and the Arbeter Ring (Workmen’s Circle). Readers may be most familiar with Tsirl’s illustrations for the popular songbooks compiled by Khane and Yosl Mlotek for the Arbeter Ring, Mir Trogn a Gezang, Pearls of Yiddish Song and Songs of Generations. For many years, Tsirl taught art workshops at Boiberik’s adult resort. Her artwork can be seen today in a number of museums. Waletzky’s father, Sholom (1919-1975), was from a family active in the early years of the American Yiddish culture movement. Sholom’s parents Moyshe (Morris) and Fradl (Frieda) were both from Mezritsh, near Lublin (in what is today Poland), but they met and married after immigrating to New York. Moyshe and Fradl were founding contributors to the relocated YIVO Institute in New York, the Sholem Aleichem Folk Institute and Camp Boiberik. Sholom Waletzky spent two years at the University of Wisconsin, but did not graduate. He enlisted in the Army during World War II, and after serving returned to New York to work in the plumbing trade for his father. Sholom joined the plumber’s union and once even picketed his father’s shop during a strike! Later Sholom became a general contractor involved with renovation projects, and managed public works projects for the Port Authority of New York/New Jersey. Josh describes his father as a “sponge” for songs. During the 1930s, Sholom even sang in a German chorus in New York. He was known in the Sholem Aleichem community as an excellent singer with a wide repertoire, and was often called on to perform at programs as well as informally at parties, or at long singing sessions held at the Boiberik adult resort’s tea house. He recorded an album of holiday songs for the Sholem Aleichem shuln. Passover seders were a showcase for the family’s song repertoire. Josh remembers many member of his grandparent’s generation having a particular song that they were known for, and could be expected to sing at the seder table . Josh grew up with his family spending summers at Camp Boiberik, and there he continued to expand his own song repertoire and knowledge of the culture. At age nineteen, Josh was appointed Boiberik’s Music Director, a post formerly held by a succession of Yiddish music luminaries such as composers Lazar Weiner and Vladimir Heifetz, and musicologist Khane Mlotek. Camp Boiberik, 1940s. Tsirl Waletky is on the left side of the front row; composer Vladimir Heifetz is third from right in the back row; Alfie Fogel, a sculptor and occasional lyricist, is second from right in the back row. During eight years as Music Director, Waletzky was responsible for compiling and composing songs for camp programs, including the annual felker yontev (peace festival) and mit-sezon (mid-season) pageants, and Friday night and Saturday morning services. He frequently collaborated with Fishl Kolko, Boiberik’s Culture Director, on developing new musical/theatrical material for the camp, and revitalized an older Boiberik tradition of writing original musicals for the camp. Though a secular Yiddishist, Kolko had a wide knowlege of East European Yiddish culture, including Hasidism. Kolko was highly influential in Josh’s musical development, encouraging him to create new musical settings of Yiddish poetry. Josh continued to work at Boiberik during the summer while an undergraduate at Harvard and a graduate student in film at NYU. In 1970, he collaborated with Zalmen Mlotek to compose the musical Chelm, undzer shtetl (Chelm, Our Town), and later contributed a number of compositions to the 1977 album Vaserl (Water), both commissioned by Yugntruf-Youth for Yiddish. In 1979 Josh helped to found Kapelye, one of the seminal bands of the early klezmer revival. Kapelye included a number of other pioneering musicians working to revitalize Yiddish music – Michael Alpert (vocals/violin), Eric Berman (tuba), Lauren Brody (vocals/accordion/piano), Ken Maltz (clarinet) and Henry Sapoznik (vocals/violin). Josh is featured on vocals and piano on Kapelye’s debut album, Future and Past (1981). During the 1980s Josh directed, edited and composed the scores for two acclaimed documentaries about Jewish life in eastern Europe, Image Before My Eyes (1981) and Partisans of Vilna (1986). The Partisans soundtrack co-produced by Waletzky was nominated for a Grammy. Waletzky also directed the Oscar-nominated 1992 film Music for the Movies: Bernard Herrmann about the legendary Hollywood film composer, and edited the 1995 Emmy-award winning PBS documentary, In the Fiddler’s House, about violinist Itzhak Perlman’s explorations in klezmer music. Waletzky’s 2001 album of new compositions, Crossing the Shadows (Ariber di shotns), reflected material he had developed over two decades, and stands alongside Beyle Schaechter-Gottesman’s albums as one of the most important contemporary contributions to the canon of Yiddish song. Through a successful career as a filmmaker (including directing and producing documentaries about Schaechter-Gottesman and Yiddish writer Itche Goldberg for The League of Yiddish), Waletzky continues to compose, and is currently collaborating with younger musicians such as clarinetist/composer Michael Winograd. This week’s Yiddish Song of the Week (and the blog’s first video posting) is a performance by Josh of Yaninke, a song he learned from his father, Sholom. As Josh tells it, Yaninke is the first song he remembers learning from his father, perhaps because of the repetitive form. Josh does not recall his grandparents ever singing the song, and speculates that Sholom learned it through the Sholem Aleichem movement. “Yaninke” is a Slavic name, and the narrative’s bucolic setting might lead one to suspect that it is a Yiddish version of a Slavic peasant folksong. 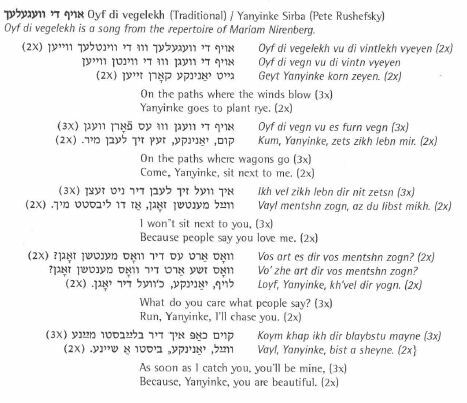 A variant of Yaninke, Oyf di vegelekh (On the Paths), was recorded by folklore scholar Barbara Kirshenblatt-Gimblett in Toronto in 1969 from her cousin Mariam Nirenberg, and released on the 1986 album Folksongs in the East European Jewish Tradition (Global Village Music). YIVO published a folio to accompany the Nirenberg recording providing extensive biographical and musicological annotations prepared by Kirshenblatt-Gimblett with Mark Slobin and Khane Mlotek. And finally we have Josh Waletzky’s performance of Yaninke. Recorded November 8, 2010 at the Center for Traditional Music and Dance and the Center for Jewish History’s program Josh Waletzky – Boiberik and Beyond: Yiddish Songs for the 21st Century. The program was presented as part of CTMD and CJH’s An-sky Institute for Jewish Culture Series. Come, Yaninke, sit down next to me. People won’t think well of me. Vos art es dir vos mentshn zogn? Vos art es dir vos mentshn redn? Loyf, Yaninke, khvel dikh yogn. What do you care what people say? What do you care what people talk? Run, Yaninke, and I’ll chase you. If I catch you, you’ll be mine. Run, Yaninke, you’re a fine one. Come, Yaninke, be my bride.